"You do outstanding work and I will tell them that. You are true professional master craftsman in my opinion. BTW – your grandsons were great to meet. You are showing the value of hard work – increasingly a rare value these days." 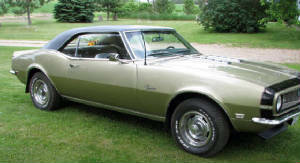 "We couldn't have been happier with the work you did on our '68 Camaro. You did a great job of keeping us informed throughout the entire process. We are very happy with the paint-job that you did. We are excited to go cruising this summer."